The open-source computer operating system ReactOS 0.3.16 has been released a few days ago. ReactOS is intended to be binary compatible with application software and device drivers made for Microsoft Windows 2000. The latest version is available as a prebuild VMware virtual machine. Unfortunately the developers published the vmdk and vmx directly, instead of an open virtualization format (ovf). This might cause some trouble when you try run it with an older version than ESXi 5.5 or VMware Worksation 10. 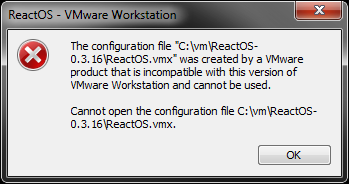 The configuration file "C:\vm\ReactOS-0.3.16\ReactOS.vmx" was created by a VMware product that is incompatible with this version of VMware Workstation and cannot be used. Cannot open the configuration file C:\vm\ReactOS-0.3.16\ReactOS.vmx. Cannot find a valid peer process to connect to. The problem is caused by virtual hardware version 10 which is not supported prior to ESXi 5.5 and VMware Worksation 10. To solve the problem you have to properly import the Virtual Machine. Download the following .ovf descriptor file to ReactOS virtual machine and use the OVF File to import the virtual machine into VMware Workstation or ESXi. Thanks, the link is dead but I was able to edit the version number successfully.